Atiyoga (Skt. ; Tib. ཤིན་ཏུ་རྣལ་འབྱོར་, Wyl. shin tu rnal 'byor) — the highest yana within the classification of nine yanas of the Nyingma school. Atiyoga is synonymous with Dzogchen. The vehicle of Atiyoga, or ‘Utmost Yoga,’ is so-called because it is the highest of all vehicles. It involves the realization that all phenomena are nothing other than the appearances of the naturally arising primordial wisdom which has always been beyond arising and ceasing. One’s mind is matured through the four ‘expressive power of awareness’ empowerments (Tib. རིག་པའི་རྩལ་དབང་, rigpé tsal wang), and one keeps the samayas as explained in the texts. The view is definitively established by looking directly into the naturally arising wisdom in which the three kayas are inseparable: the empty essence of naked awareness beyond the ordinary mind is the dharmakaya, its cognizant nature is the sambhogakaya, and its all-pervasive compassionate energy is the nirmanakaya. The meditation consists of the approach of cutting through resistance to primordial purity (Tib. kadak trekchö), through which the lazy can reach liberation without effort, and the approach of the direct realization of spontaneous presence (Tib. lhundrup tögal), through which the diligent can reach liberation with exertion. The conduct is free from hope and fear and adopting and abandoning, because all that appears manifests as the display of reality itself. 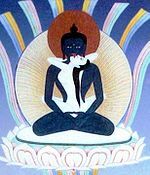 Perfecting the four visions of the path, one gains the supreme kaya, the rainbow body of great transference (see rainbow body), and attains the level of glorious Samantabhadra, the thirteenth bhumi known as ‘Unexcelled Wisdom’ (yeshe lama). Jamgön Kongtrul, The Treasury of Knowledge, Book Six, Part Four: Systems of Buddhist Tantra, translated by Elio Guarisco and Ingrid McLeod (Ithaca: Snow Lion, 2005), pages 337-346. This page was last edited on 16 February 2012, at 16:51.